We are back with Hip Hop/NerdSwag artist Manus! Manus and I first met a long time ago in Burlington VT, so it was awesome to catch up and see where we’ve been. We got to talking about his past, moving, when he started rapping and how all that lead him to the Nectar’s stage and beyond. We’ll hear some old tracks of his from the Burlington days and then some of the new bangers he is working on. Look out for his song “DSGD” now on Spotify. I had a great time with Manus, chilling and talking Hip Hop, comics and all the nerdy delights around his place. So enjoy and shout out to A-Dog for the opening few tracks! 802!! We are back this week with amazing artist, writer, re-imaginer and Executive Producer of the new TMNT cartoon Ciro Nieli!! We had a serendipitous meeting out side of a Claypool Lennon Delirium show that lead to this amazing and informational episode. We got deep into Ciro’s comic roots, his deep seated love of the Turtles and what inspires him and the new path of the Turtles. Also what moved his career and where it will go next. This is also our 50th anniversary!! The 50th episode!!! So cool! Enjoy it y’all!!! GOONGALA!! We were somewhere around San Diego on the edge of the ocean when the comics began to take hold. This week we are back with our Gonzo round-up of the 2016 San Diego Comic Con. I was lucky enough to attend this year’s con and work the Greg Horn Art booth. With my handy mic I was able to traverse the convention floor and collect some amazing interviews from some of comic’s most interesting and legendary names. Dave McKean, Stan Sakai and Geof Darrow to name a few. The Gonzo began to take hold as I also had my mic on during some late knight adventures with the one and only Truce II Head Rush. Then on Saturday the adventure of Comic Con>Phish lead to some amazing realizations and a chance meeting with the weekends white whale. Listen in for more Gonzo/Comic goodness! This week we are back, live in the studio with Dave “King Gum” Crosland. Dave was kind enough to have me over to his studio where I got to revel in the artistry throughout the interview. We got to talk about his artistic start with concert posters, his travels, some of the strange and unusual projects he’s pitched for and much more. Dave also hand picked (how else do you pick stuff) all the music for this episode (mostly) and chose songs that played pivotal roles in crucial times in his life, ups, downs, slings, arrows, and gum. So sit back, relax and check out my chat with King Gum! Comics: Invader Zim, Puffed, Scarface: Scarred For Life, Yo Gabba Gabba, CBGB & OMFUG, Bad Ideas, Slop and more. 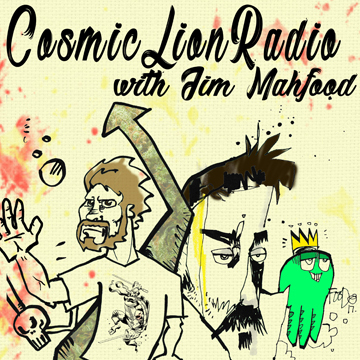 Cosmic Lion Radio is back but we moved!! We are now live from California and we’re back with an amazing show! We re joined by Fred Moore, taper, musician and friend of New Hope Pa. In this first of two episodes “from the tapers section” we get to hear Fred’s own recordings of some of his first shows taping two of the most pivotal bands in his life, The Grateful Dead and Ween. We’ll chat about a mutual love of Star Trek and then get down and dirty about taping and what all this music means to us. 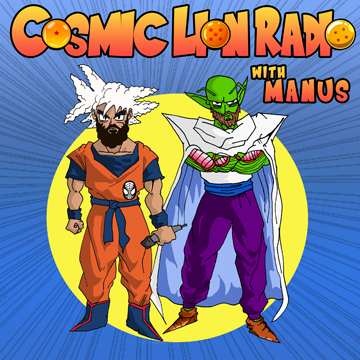 So strap in and turn on a new episode of Cosmic Lion Radio! Fear and Loathing in Las Vegas Graphic Novel artist Troy Little joins us this week on Cosmic Lion Radio. In addition to Fear and Loathing, Troy is also the artist and writer on IDW’s Powerpuff Girls and his creator owned comics Angora Napkin and Chiaroscuro. Troy also has worked in animation for quite some time, working for Spümcø and on many cartoons you know like Ren and Stimpy, Ed, Edd and Eddie and Heavy Metal 2. These jobs have taught him a lot and he shares some of that wisdom with us this week. Troy also chose all the music for this week’s episode and there are some real rockers. So sit back, relax, grab a Singapore Sling with mescal on the side and enjoy this weeks ep! This week we are back with a special 2015 year in review. Dylan Owens, the music editor of the Denver Post joins us to talk about some of our favorite songs of 2015. We are all over the musical spectrum from Joanna Newsom to JAY-Z. We’ll touch on the resurgence of vinyl, how to really get a job and then wax philosophical about the power of the click. So sit back and enjoy our look at the music of 2015. We are back with Teenage Mutant Ninja Turtle co-creator Kevin Eastman!! Such an awesome time talking with him about his new Fan Club project, TMNT/Batman, Grant Morrison and much more. Also this week, back to the funk!! Another hand picked mix-tape of Afro-Funk and soul from the Cosmic Lion. Hop in for more funk then you can shake a mutant turtle at! This week we celebrate the Grateful Dead’s 50th anniversary by talking to the host of ‘The Grateful Dead Hour,” David Gans. We’ll explore the far-reaching corners of the Dead archives by exploring interpretations of the Dead’s music through out history. We got to talking, and we found out that the heart and soul of the Dead is really the heart and soul of what Bobby called “misfit power.” Fifty years later here we are, “Fare Thee Well” is about to happen heralding the end of “The Grateful Dead.” What legacy has the Grateful Dead left? How has The Grateful Dead changed American music forever? Find out this week on Cosmic Lion Radio. Welcome back to Cosmic Lion Radio! This week Brennan Wagner the colorist for such amazing comics as Django/Zorro, Grendel vs. The Shadow and the upcoming The Spirit miniseries joins us. We get to talk about growing up in the industry, his love of music, Comic Book Rock Stars and we even chat about our mutual love for Jim Mahfood. Talking with Brennan was really great. This guy is the real deal, super talented and super cool. Enjoy. This week we are on location with Guy Bickel. Guy is a sound engineer who has toured the world with some of the biggest and best touring acts that have ever graced our ears. Frank Zappa, Bootsy Collins, Cameo, Diana Ross, Mother’s Finest and more. He was also the bass player from the Cleveland Ohio Space rock band Pi Corp. During our talk Guy and I spoke about many things, touring, favorite shows, and what it was like to see Pink Floyd at their psychedelic peak. Guy even played me some recordings of these great artists he made while they were on the road. These are one of a kind jams from deep in his archive. We talked for a good 2 hours so I will present this in 2 episodes that I have titled, “The Sound Guy Chronicles.” Enjoy!! Welcome back to Cosmic Lion Radio, the New Years Edition!! This week we sit down with two amazing guys who have had many amazing New Years experiences. First, Chris Friday, Production Manager at Higher Ground in S. Burlington Vt and ¼ of the Comedy gold that is Touchpants. We talk about all manner of things including the Touchpants show on New Years at the legendary Iridium Jazz Club in NYC and the business side of what makes New Years a great night for a club. Then we talk with David Gans, musician and host of the nationally syndicated radio show “The Grateful Dead Hour.” We get to hear an amazing story about his experience broadcasting the 1990 Grateful Dead NYE show and hear about some special guests that helped him out that night. Some really amazing stories all woven around amazing musical moments from years past, all-occurring on New Years. So enjoy and Happy New Year! Also huge thanks to Wolfgangs Vault and The Bill Graham Foundation for the help with this podcast! This week we are honored to present the Gonzoest podcast ever. We welcome Wayne Ewing from Hunter Thompson Films to the show. Wayne is an Emmy nominated filmmaker, a roving reporter, and was, at one time, Hunter Thompson's Road Manager. Wayne has also made 4 films about the great Doctor of Journalism, “Breakfast With Hunter,” “When I Die,” “Free Lisl,” and “Animals, Whores & Dialouge.” Wayne talks about his early film work and he tells of that fateful night at San Francisco’s O’Farrell Theatre where he met Hunter Thompson who was the night manager at the time. This episode was a real honor to do, it was great to talk to some one who looked to Hunter as a Hero, as I do, and was able to meet him and document his incredible life. So please listen in and be sure to check Wayne’s Work out by clicking the Bold words above! All that and more on this weeks Enhanced Podcast!! This week we dive head first into Hip Hop history with my Hip Hop Guru TRUCE II HEAD RUSH! We explore early Hip Hop hits, alternative forms of Hip Hop, consciousness, and friendship. We also get a candid look at a real artist, a guy who has been making great music with great people for a really long time. We get to hear an early hit, a song that was a favorite song in my Hip Hop growth. We also get to hear where his music is going and how it is progressing. I am very excited about the Hip Hoppiest podcast EVER!! Welcome back folks! This week is really amazing!! We spent some time at the "Worlds Largest Record Store" in St. Petersburg Florida, Bananas Music!!! We met with the owner Doug who showed us around the store and took me to the warhouses warehouse! In this 'vault' we found some very special 78's and we found the true meaning of record "Albums." Spattered with a few historical picks by me this weeks podcast is really special. All tracks in the podcast were recorded from their original vinyl presings. So turn the lights down, put on your teashades, and chill out with this weeks "All Vinyl Edition!" The Time Circuts went crazy and delivered us an episode from exactly one week in the future. I could not resisit putting it out before 16, but who cares about numbers. In this episode we get back to what made us, us, MUSIC! We put the Time Circuts back into use to speak to two journalists I asked to write a special peice about the show. We also have a special trivia round this week and many more amazing songs designed to blast your face off!! So, let's GROOOOOOOOVE! The Late Knight Disco edition featuring Wyllys live from the Crowbar in downtown Ybor City, Florida. We also feature coverage from our stream of consciousness reporter in the field Eli. Special tracks in the Disco/funk vein and A special version of the new york hustler ensemble’s new song “Precipice” from Jam cruise featuring many amazing guests. This edition could not get better. Wyllys and i met in Burlington Vt so this edition we honor DJ A-Dog... Rest in Power!! Released in honor of the Vermont Flood benefit and featuring rare cuts from deep in the vaults. I bet there is something new here even for the biggest Phish nerd! An intimate interview with Roots of Creation about the past present and future of the band and life as Dubtronica legends. Featuring the World Podcast Premier of the new single "Different" by RoC and the Rubblebucket horns. The biggest and best podcast yet. Special guest Truce 2 Head Rush, my hip-hop guru. More great tunes and a special announcement from Happy Brain Design. Oh yeah!! Our second journey into the world of Cosmic Lion, feel the burn!